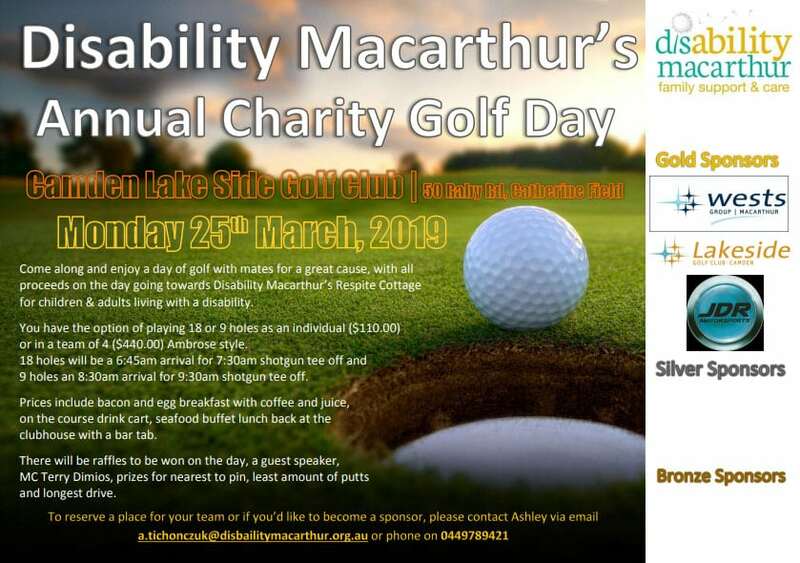 Come along and enjoy a day of golf with mates for a great cause, with all proceeds on the day going towards Disability Macarthur’s Respite Cottage for children & adults living with a disability. You have the option of playing 18 or 9 holes as an individual ($110.00) or in a team of 4 ($440.00) Ambrose style. 18 holes will be a 6:45am arrival for 7:30am shotgun tee off and 9 holes an 8:30am arrival for 9:30am shotgun tee off. Prices include bacon and egg breakfast with coffee and juice, on the course drink cart, seafood buffet lunch back at the clubhouse with a bar tab. There will be raffles to be won on the day, a guest speaker, MC Terry Dimios, prizes for nearest to pin, least amount of putts and longest drive.